27 gusting to 35 mph Hope Town, Abaco, yee ha! Indicas here I come. The area of the hub of the Abacos has gone OFF since last night. Waves, good wind, all the necessary food groups for great sessions. How is it in New Providence and the Exumas? Not too shabby over here, been on the North beaches since Sunday, winds from 16-20kts, I wont complain especially since its MAY! Here's some more Bahamian weather info from weatherunderground. Click on the above image to be taken to the realtime weather page. 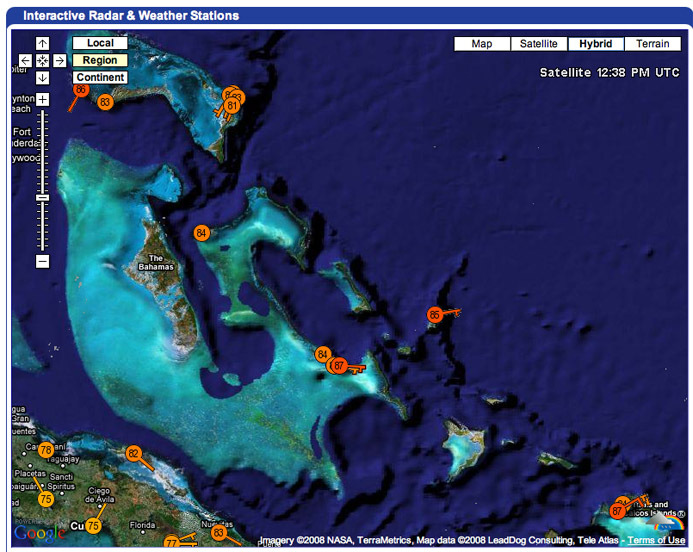 Just learned of yet another site, possibly with useful weather info not only in the Bahamas but also for getting there. Be sure to animate the charts to help with spotting trends. Just came across something on the NDBC site. Includes stations worldwide, this view deals with our part of the Basin. 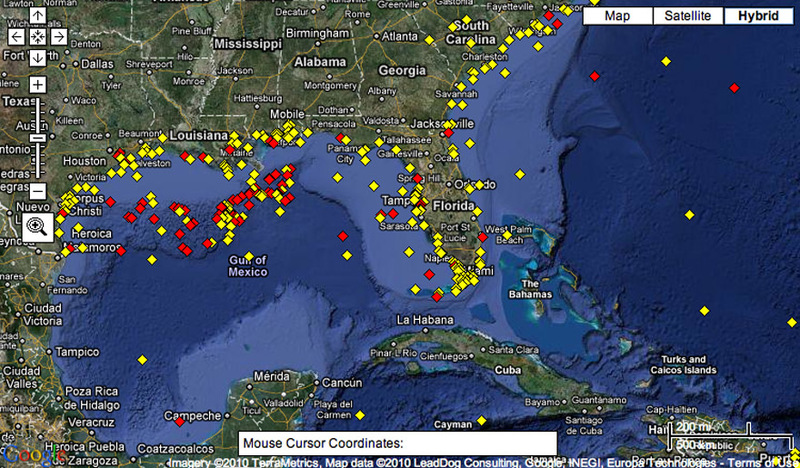 It shows view stations within the Bahamas but has some nice offshore stations to the north, west and south to help identify inbound trends. I'm thinking of going to one of these places in the last week of july or first of august. How bad is the wind there during summer ,Can I get at least 10 Knts everyday? Checking windguru and windfinder, wind stays in the 15 knots range direction e/se, what's verry good. Is it right?? or I shoud forget these places since season is over. but apparently they are out of there at that time of year. For only a week or so it is hard to say what might come through. This is the off wind season for the Western Bahamas. Just put up windgraph records for Georgetown, Exuma from last year for July and August. I've often wondered if they have summer tradewinds in that part of the Central Bahamas. Looking at the consistent easterly direction, it looks like they do, weaker ones anyway. The graphs are in mph not knots. It isn't as bad as I thought it would be, looks rideable rigged for light conditions (big board, good sized kite). Each year varies in these strange weather times were in however. A tropical system could increase or completely mess up the winds you see below. You're in prime time for tropical activity in late July and August. Contrary to common belief hurricanes and tropical storms can really mess up kiting (kiters too) at times. Eddie Toy just told me about this site on Elbow Cay, Abaco (Rocky Bay).